By the time she turned 90, Virginia felt depressed. She was suffering from the effects of diabetes, high cholesterol, and hypertension, and her ability to participate in daily activities was declining. "I used to stay home, had nothing to do, was having trouble getting in and out of bed, walking short distances, and getting short of breath," Virginia said. Her family noticed, and took action. "My daughter called and arranged for me to see a physical therapist I had seen in the past," Virginia said. 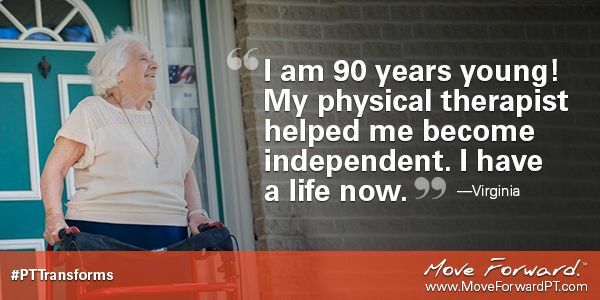 Her goals were to get stronger, improve her balance, and learn how to move more safely. Her treatments included balance exercises as well as catching and kicking balls, and doing "obstacle courses." After a few months, Virginia noticed a difference. She was able to get in and out of chairs and her bed without assistance, and she was walking longer distances without feeling short of breath. Best of all, she didn’t feel isolated anymore. "Now, I am outgoing and happy," said Virginia, who is now able to regularly attend church, visit friends, and take trips to the shore with her family. "I even went back to work for a few hours each day. Not bad for a 90-year-old!" Thanks to the creativity of her physical therapist, Virginia said her treatment was "hard, but fun." And the results speak for themselves. "My neighbors have made positive comments about the change in my personality and lifestyle," Virginia said. "I am proud of the progress I have made with physical therapy. I have a life now."